Open...and Shut Apple' iOS has over 425,000 apps, with over 15 billion downloaded, according to Apple. Google Android? It has 250,000-plus, but that number is growing at a faster pace than iOS. According to research by Adobe and Forrester, however, a rising number of developers may decide to forego the arms apps race entirely, preferring instead to optimize their mobile web presences. What you build, it turns out, depends on what sort of business you run. Since a minority (38 per cent) of developers have an established mobile strategy, according to Forrester's survey results, the war between apps and the web is just beginning. As Adobe's survey of 1,200 North American mobile users suggests, some activities lend themselves to the mobile web-browser model more readily than others. The majority of shoppers (66 per cent), for example, prefer to use their browser when buying goods and services on their mobile device. 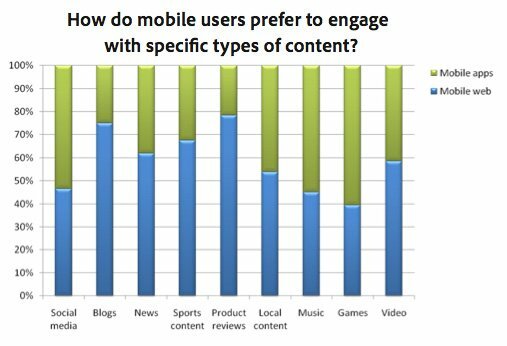 An even higher percentage (79 per cent) use the mobile web for product research prior to purchasing. The numbers flip-flop, however, when one considers social media or games. A slim majority of survey respondents (52 per cent) prefer a dedicated app to check Facebook and other social networking services, and 60 percent look to apps to fulfill their gaming needs. This jibes with my own experience. While I've used eBay's dedicated app to scan for cycling and ski gear, I strongly prefer to use eBay's mobile web site. Why? Because when I'm shopping, I don't want to confine myself to one retailer or shopping service. I want to use Craigslist, eBay, Backcountry.com, and then I'll Google for sites that I may not have considered or known about. I don't want to dive into an app to search for Rossignol S7s, then resurface so that I can dive into a separate app, then do the same thing over and over again. It's slow. It's inefficient. It's nowhere near as fast as simply opening a new browser window. Contrarily, when I'm in Facebook, I want to be in Facebook. I don't need to be flitting between Facebook and other services. The same holds true for games: when I'm playing Rogue Touch, I am dedicating all of my attention to the game. I also want the performance that comes with a dedicated, native app. And because we tend to spend much more time on games and social media today, according to Adobe's research, it's no wonder that apps get so much air time in the media. Note, however, that this isn't really a question of web app versus native app. While web apps may not be suitable for all things (I, personally, would never attempt to develop a first-person shooter game to run in a browser), you can use PhoneGap to wrap a web app in native code such that it can be purchased through an app store and so that you can overcome most performance or UI shortcomings you may find in web apps. No, it's rather a question of web sites versus apps, whether pure native apps or hybrid web apps. Today, over 90 per cent of e-business professionals either have a mobile-optimized website or plan to have one soon, according to Forrester. It may well be that many of these companies will opt out of the app revolution entirely, depending on the nature of their business. More likely, however, is that as they gain experience they'll opt for an "and" strategy rather than an "either/or" strategy – a course suggested by other Forrester analysis. Despite the suitability of mobile-optimized websites to a variety of businesses, however, expect the app revolution to continue. Why? Because Forrester finds that 66 per cent of those surveyed cite "customer engagement" as a top priority for mobile, and having a dedicated app is an obvious way to encourage engagement. What is clear is that mobile is big, and a one-size-fits-all approach, whether web- or app-centric, is almost certain to be wrong. Full disclosure: My employer helps companies build mobile (web) apps. So I probably fall more on the app side of this debate. Even so, my own experience is that there are a range of mobile activities – such as those listed above, as well as reading news, blogs, and so on – that resist the app experience. At least, for me. Matt Asay is senior vice president of business development at Strobe, a startup that offers an open source framework for building mobile apps. He was formerly chief operating officer of Ubuntu commercial operation Canonical. With more than a decade spent in open source, Asay served as Alfresco's general manager for the Americas and vice president of business development, and he helped put Novell on its open source track. Asay is an emeritus board member of the Open Source Initiative (OSI). His column, Open...and Shut, appears three times a week on The Register.